Sore throat can be annoying and the condition worsens when it is accompanied by a dry cough. Sore throat and cough can develop due to allergy or infection. Shouting at any event or continuous talking at presentations can also cause a sore throat, which may then lead to coughing. 1. Salt water: Take a glass of lukewarm water and add a tablespoonful of normal salt and gargle with it three to four times a day. Salt acts as natural expectorant and thin the phlegm which can be easily expelled out. 2. Honey: Take a spoonful of honey and swallow it slowly enough so that it can coat the irritated mucous membrane in your throat. Studies found that honey is a far better soothing agent than the over-the-counter lozenges. 3. 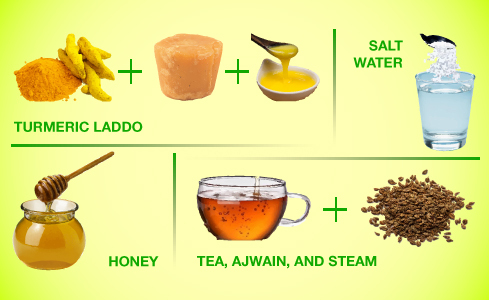 Tea, ajwain, and steam: Mix 1 tablespoon, tea with 2 tablespoon ajwain and add them to boiling water. Inhale these scented steam to get quick relief from congestion and irritation. While the steam loosen the phlegm, the essential oils in the tea and ajwain will hasten healing due to their anti-viral, anti-bacterial and anti-inflammatory properties. 4. Turmeric laddo: This is a ‘Desi nuskha’ from grandma's kitchen. Mix 3-4 tablespoon of turmeric with some jaggery and some hot ghee. Mix all the ingredients and make small Laddos and have them 3-4 times a day. Jaggery and ghee acts as soothing agents while turmeric hastens healing because of its anti-inflammatory and anti-bacterial properties.